The new gun law is about to take effect. 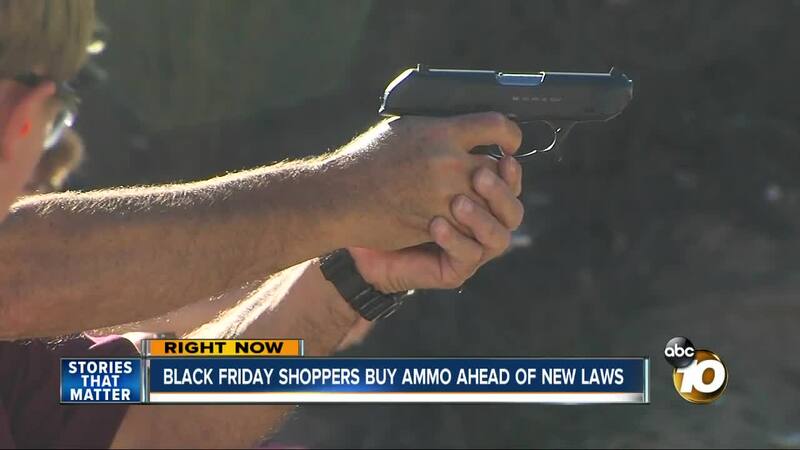 SAN DIEGO (KGTV) - It's a new twist on Black Friday shopping. Customers are flocking to buy ammunition before a new California gun law goes into effect. It’s called the “1 million round month.” Just a few hours after opening its doors, Poway Weapons and Gear Range sold half of their 1.2 million rounds of ammo. The new law starting in July says in addition to a gun permit, gun owners will have to pass another background check to buy ammunition. Retailers will then have to log the amount of ammo gun owners purchase in a database. The records will be sent to the Department of Justice. “The bottom line is regardless of how people try to prepare themselves before the law goes into effect, majority of Californians voted on Prop. 63 that put these laws into effect." Store owners say they will order more ammunition for customers to purchase at a reduced price. The “1 million round month” sale will end December 31st.